Now that the craziness with my cats is finally dying down, I’m having a little more time to get out into the garden and shoot some pictures. (Raja’s paw ever so much better.) We have had some up-and-down weather. One day it’s 80°, the next day it’s 50°. Yuk. I have had enough of this. This weekend is supposed to be nice again. 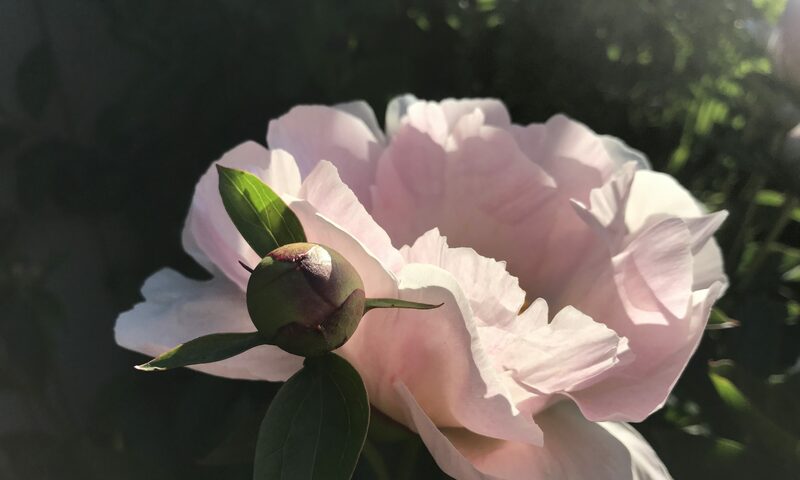 My peony season was pretty much a bust because of all the rain but I finally did get some nice pictures of what remained. They are almost all finished now. Here is one of the nice ones. My daylilies have finally started blooming, but there are not too many of them just yet. Still I have gotten some of my favorites to start blooming. The rain is back but I did get out in the garden this morning to take a few pictures. Most of the ones I photographed are yellow flowers or yellow foliage, but not all. Take a look at my sunny flowers on a rainy day. I just started writing this post and it has started pouring, with a little thunder. Now at least Stella D’Oro is a really sunny looking flower, and such a ubiquitous daylily. These Yellow Daylilies are huge and they were so lovely yesterday. Today they are all rain beaten. But there are many more buds to come. This is my favorite Yellow Daylily with the beautiful Purple/ Magenta throat and border. This one is just beginning to open up. See the rain drops on the petals? My light orange Rose is a very sunny flower. The shrub has been putting on a real display already this year. In fact, all of my roses are just lovely. And my firey orange Poppy is turning up the heat on this cool, rainy day. As is my magenta Daylily. And my Firecracker Begonia. Making me feel a little warmer just looking at them. It is not without reason that the Kniphofia is called a Hot Poker Plant. You can’t see it well, but this Hot Lips Mexican Salvia has prettly little flowers that turn red and white. I have wanted one of these for years, and finally got one. More reds and yellows in my garden. My Strawberries are giving me a wonderful harvest right now. And my Yellow Foliage Cape Fuschia lights up my garden. Topping off my Firey Flowers is my favorite Clematis Niobi that is in full bloom right now. And this view of Yellow and Orange Daylilies greet me from inside my house looking outside. Not so bad seeing a view like this on a rainy day! Oh yes you have beautiful blooms, flowers which don’t grow in our hot tropics. And i love so much that daylily with dark margins, reminding me of the Hippeastrum picotee that i cannot gain hold of just yet. Thanks for stopping by. Oh, and thanks for reminding me of GBBD. I will have to go over there. Thanks and thanks for stopping by. I hope that you do have some strawberries in your garden. I need to go survey mine again for some. Very pretty! I love the day lilies and the poppy. Thanks. And thanks for coming by. That poppy is one of my favorites. I loved this wonderful variety of flowers you shared with us today. All your photos are great and I thank you so much for sharing them with Today’s Flowers. Would you be willing to share two or three of your favorite flower photos on our home page in our Guest Friend spot? If you are interested you can send them to me at luvinwildlife@hotmail.com, and if you could please put ‘TODAY’S FLOWERS’ in the subject line, this would prevent it from dropping into my spam folder. As friends send me their photos I add them to a list in the order received, and let them know when they will be shown. Thanks and thanks for coming by. I am so far behind. I hope I am not too late to share with you. You have gorgeous flowers! Love the gentle rose but too bad about all that rain just as it’s all in bloom. Thanks and thanks for stopping. That was sad to not be able to get outside. OTO! It is supposed to start raining again. The perfect opportunity to plant a clematis and two peonies that have been sitting in pots. Will stay cool for several days. Yael..your strawberry mulch is nuts or acorns of some sort ? Those are hazelnut shells. I like how they look, but stopped buying them because they hurt my kitties paws. Wow what a beautiful yard full of flowers. I’m afraid we won’t have much color in our yard this year. We are starting over at a new place and we got a late start so not much for 2013. But next year will be great. Thanks for posting a little inspiration for me!! Thanks. I hope that you enjoy your new home. What a wonderful array of photos, wish I was getting berries, mine are struggling in the heat. Thanks Karren and thanks for stopping by.